Go Green Grants Are Back! Peace, Love & Planet is proud to offer $50-400 Mini Grants to student lead, environmental initiatives! Education and awareness campaigns are essential to preserving nature and conserving resources. Student efforts make a BIG IMPACT! 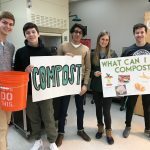 We are happy to support meaningful projects, developed by students, that encompass the core values of “reduce, reuse, recycle and respect” for the environment. See page 3 for criteria. Thank you for your dedication to promoting environmental awareness!